Our last day and night in Delhi turned out to be fairly active after all. I was hoping for another day of doing nothing, but we ended up out for lunch, shopping at bit (by force), and walking the streets of Panchsheel Park this evening. At least I snuck a two hour nap in this afternoon. Lunch was another excellent Indian place, and the reason we shopped by force is that we arrived over an hour before the restaurant even opened. We killed time mostly in a book store because most of the shops were closed as well. Does nothing open before noon around here? The streets are certainly busy enough 24 hours to signal something is happening. Maybe people just drive around and honk at each other until around 12, then go to work. 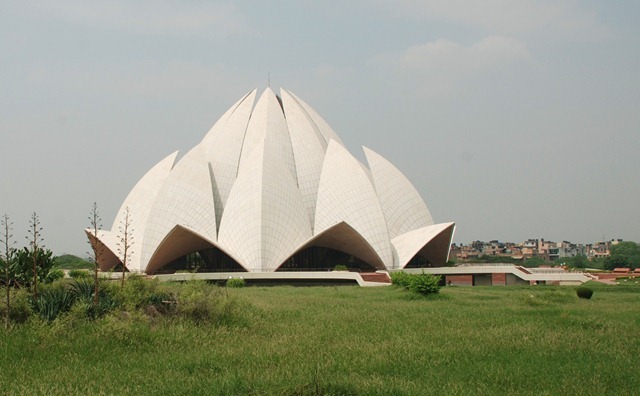 After lunch we tried the Lotus Temple one more time and it was closed again (at least we took a picture this time). Three strikes for Shiv. Bad week I guess. Speaking of busy streets, we finally decided we’d had enough of being chauffeured everywhere we went and ordering in dinner. Susan’s place is great, but we’ve been getting lazy so we ventured out into the untamed streets, much to the horror of the security guard at the house. It was fun and enlightening. It began with a nice, but hot, walk through the streets of the neighborhood which is quite a wealthy and safe place for Delhi. Eventually we reached the end, passed through the gates, and were instantly right in the middle of it all. Chaos. Tuk tuks, motorcycles, cars, bicycles, pedestrians, wild dogs, you name it. We eventually found some food (Italian again – ugh), went to the grocery store, and then walked for about 30+ minutes back. By this time it was dark and the neighbor hood was a buzz with activity (although it is 24/7, so not sure what the dark had to do with it). There were food stalls galore, auto repair shops, a mosque with several shrines along the street, wild dogs everywhere (at least 100 in our short walk), furniture stores, pot holes, kittens, beggars, welders, kids playing badminton, people bathing, people building things, people tearing things apart, people doing nothing, you name it. Oh, and did I mention wild dogs? Anyway, it was a great last night in Delhi. Tomorrow morning we will do this walk again (Ty found a promising coffee shop for an attempt at breakfast) and then head to the airport for our flight through London to Reykjavik, Iceland, where the temperature is half of what it is here. Wish us luck!